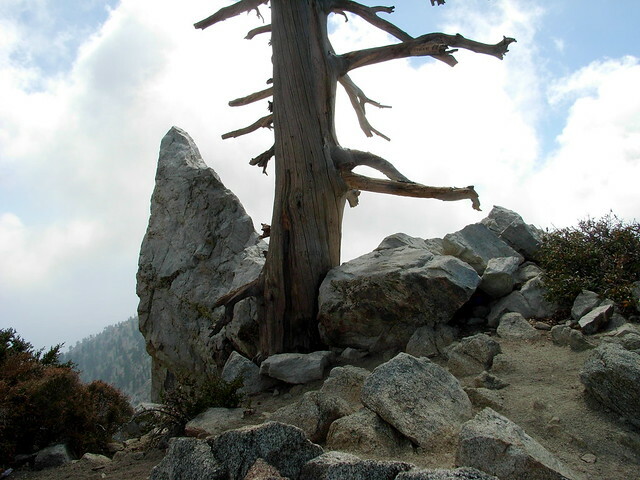 A 14 mile in-and-out that hits two of the tallest, most prominent peaks in the Angeles National Forest. Beginning with the historic, alpine brook that runs through Icehouse Canyon, this trail climbs through picturesque pine and cedar to Icehouse Saddle before visiting the site of an old trail resort and ascending a long ridge between the two peaks. 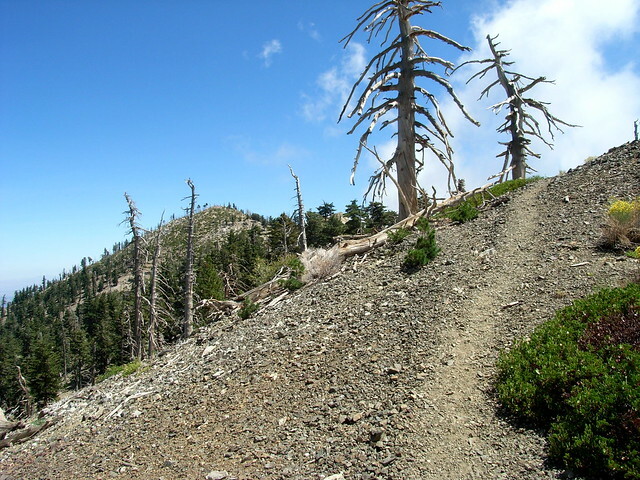 A truly magnificent and rewarding hike, with great views of the Baldy Bowl for almost the entire route. Highly, highly recommended. 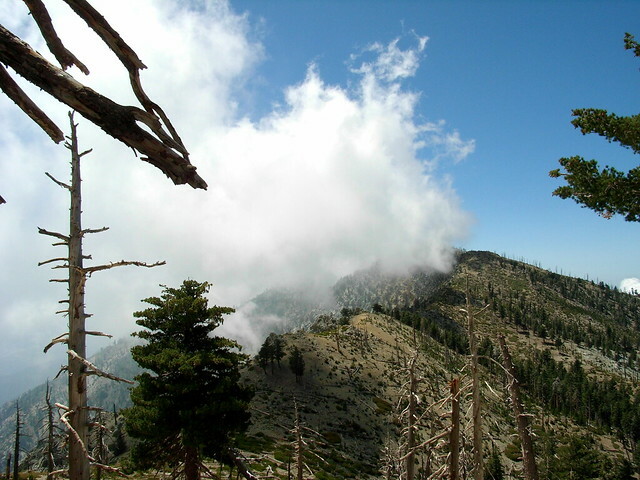 Additionally, since this hike enters a Wilderness Area, you should stop at the Mount Baldy Ranger Station on the way up for a Wilderness Permit. The Ranger Station / Visitor Center is well-signed in the village of Mount Baldy. Walk-up passes are available, and if you’re staying overnight, it would be wise to consult with the rangers to see if any inclement weather is on its way. Whenever I feel like I need a kick in the pants to get going, or a reminder of why it’s so damn great to live and hike in Southern California, I head to Icehouse Canyon. Ever since I drove through a rainstorm, climbed up through the clouds and into a perfect October sky for a hike here in ’06, I have always loved this region of the San Gabriels — and so to alleviate a mild funk I’d been in, I packed up, got an early start, and headed toward Mount Baldy Village. 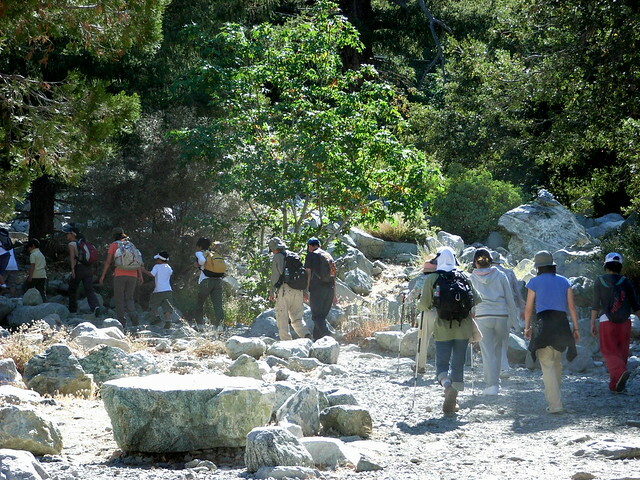 This hike starts at the end of Icehouse Canyon Road, at a parking lot where the road dead-ends. This lot is usually pretty full of cars — especially on holidays. The local population flocks to this trail, but the vast majority stick close to the parking area. 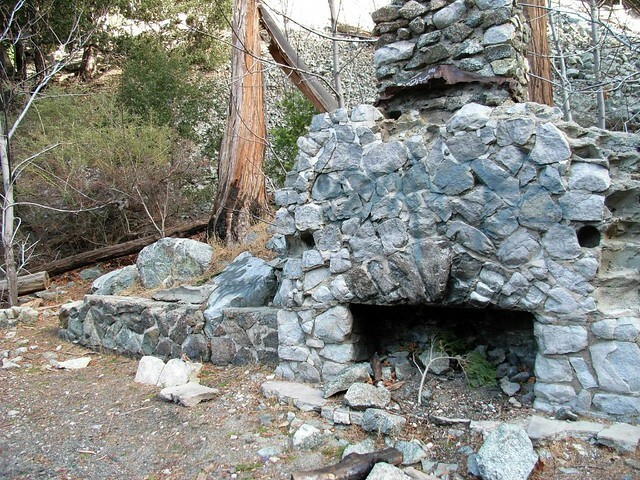 Just to the east of a restroom is the start of the trail, on pavement that runs just past the site of the historic Ice House Canyon Resort — a beautiful wood and stone tavern that stood in the area from 1921 well into the 1980s before burning down in a mysterious fire. Today, there’s not much left. If you’re not in a mood to rush, but still want to avoid crowds, I’d suggest taking a detour into the actual creek bed itself for a little bit of boulder hopping. You’ll have a far greater appreciation of the serenity of the area — just be on the look-out for stinging nettles, which love the water-soaked soil. Your alternative is just to power through the crowds. There is still plenty of great scenery to take in as the trail ascends along the canyon walls, passing 34 beautiful turn-of-the-century cabins along the way. 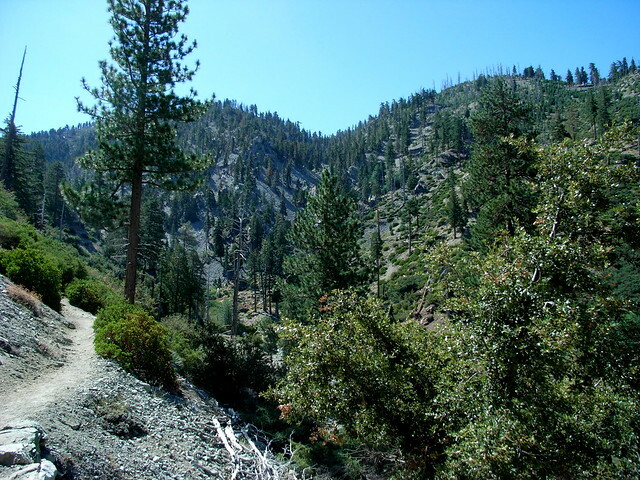 .9 miles from the trailhead, the Icehouse Canyon trail meets up with the Chapman Trail, which switchbacks up the ridge to the north, enters Cedar Glen Campground, and then meets back up with the Icehouse Canyon trail further up the canyon. I’ve never taken this route, personally, but it will get you to the same place and add 1.8 miles to your trip one-way. 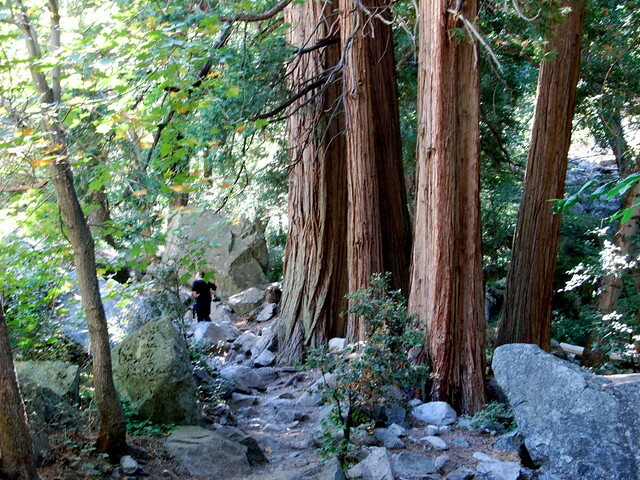 Instead, ignore it and continue east along the Icehouse Canyon Trail. In another half-mile, you’ll cross a small footbridge on a side creek, and leave the watery portion of the trail. Here, the landscape makes a shift from the riparian grasses and ferns of the creek to a more stark, boulder and talus-strewn area. The canyon views open up, shaded by incense cedar and ponderosa pine. 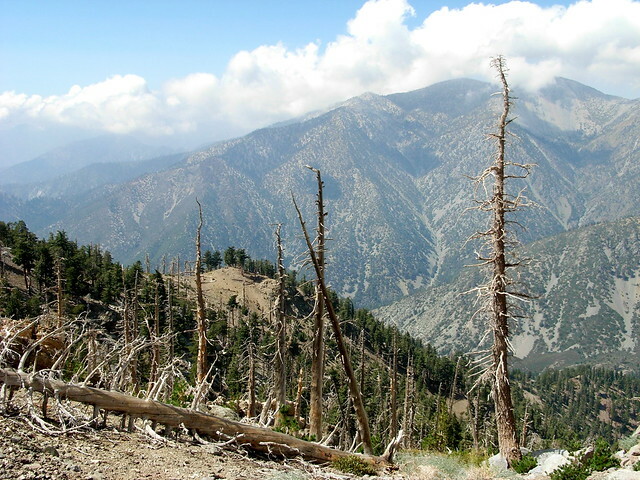 The trail passes a few skeletons of old cabins and then navigates east through more rocky terrain, eventually entering the boundaries of the Cucamonga Wilderness — which straddles the border between the Angeles and San Bernardino National Forests. About a half mile from the Wilderness Boundary, the trail leaves the rocky bottom of the canyon and starts a series of long ascents and switchbacks along the canyon’s northern wall. 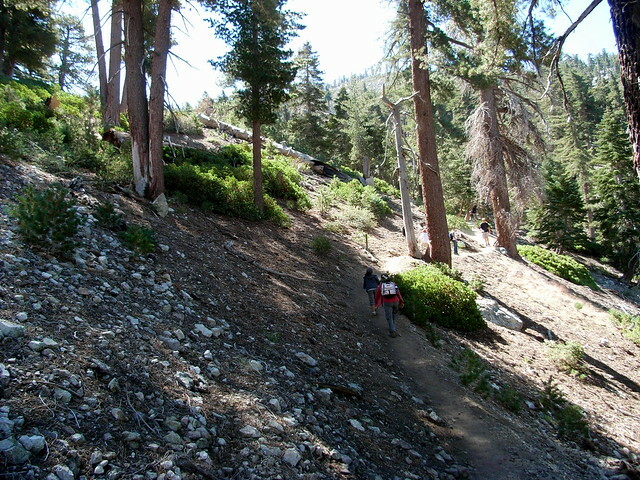 After 1.9 miles and 1649 feet of elevation gain, the trail reaches Icehouse Saddle (el. 7555), a cleared, constantly windy, and often crowded rest spot. This is where most of the hikers who make it up from the trailhead have their lunches and turn around. Icehouse Saddle is notable for the sheer number of options a hiker has when he or she reaches it. 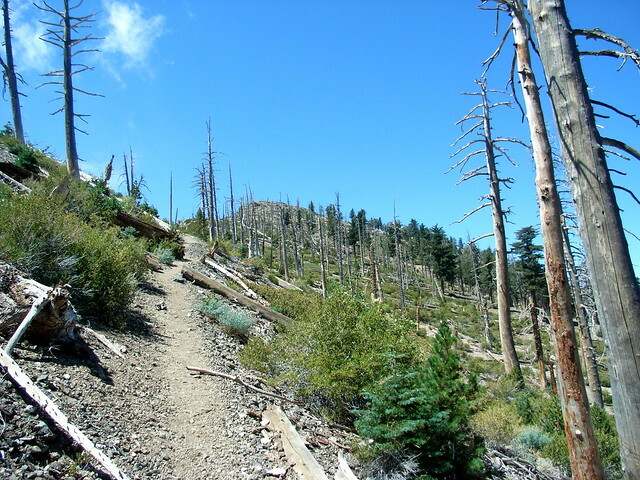 You can tack on 1.8 miles round trip to hit Timber Mountain, 4.8 to tackle Cucamonga Peak, or continue along the Ontario Peak Trail on this route. 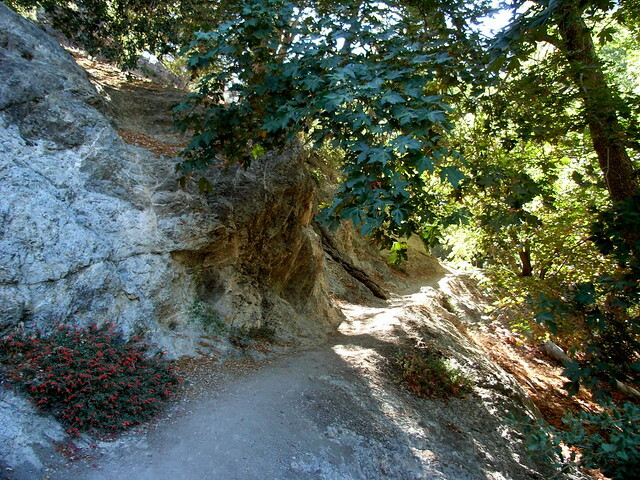 From the Icehouse Canyon Trail, travel a few yards south until you run into a trail that heads back west, along the south side of the canyon. 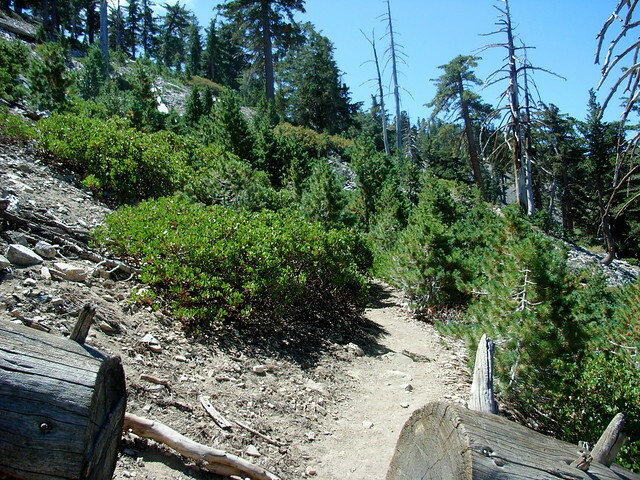 This trail continues along the southern side of Icehouse, through very pleasant alpine forest and manzanita on its way to Kelly Camp. 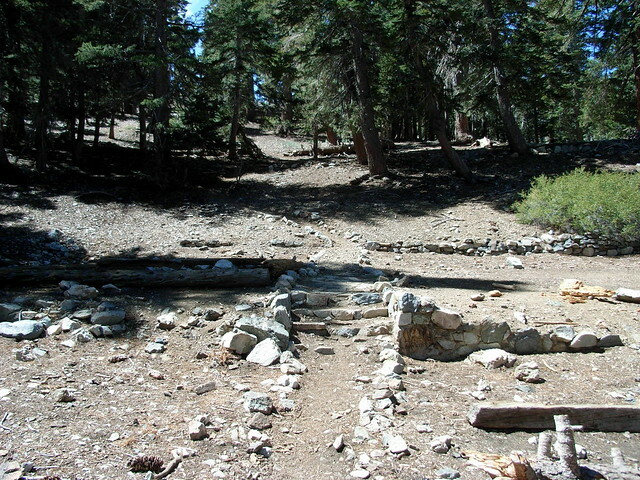 Kelly Camp itself is on the site of a former backcountry resort, and you can still very clearly make out the foundations of several of the old buildings. Thankfully, dirt and pine needles have made the rest of the ground soft enough for sleeping bags. The trail continues, passing through some of the old foundations and climbing up onto a ridge just to the south of the camp. If you’d like to make this the end of your day’s trip, hitting the surrounding peaks on day-hikes is more manageable. And I won’t guarantee anything — but everyone I’ve known who’s camped at Kelly has seen bighorn sheep in the morning when they wake up. Here, the landscape is peaceful and quiet. The crowds from Icehouse are almost completely gone by now — I only ran into another three or four hikers for the remainder of my time on the Ontario Peak Trail. 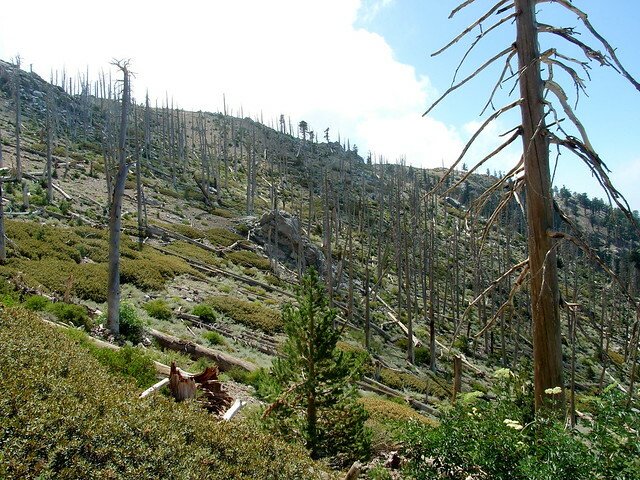 Take time to enjoy it as you continue hiking southwest from Kelly Camp through tall conifers, eventually breaking into open skies at the northern slope of the Ontario-Bighorn Ridge — a likely victim of bark beetles. Continue as the clearly visible trail hops over a downed tree and keeps heading up and to the southwest (at the downed log, there’s a use-trail that meanders to the east. Ignore it). 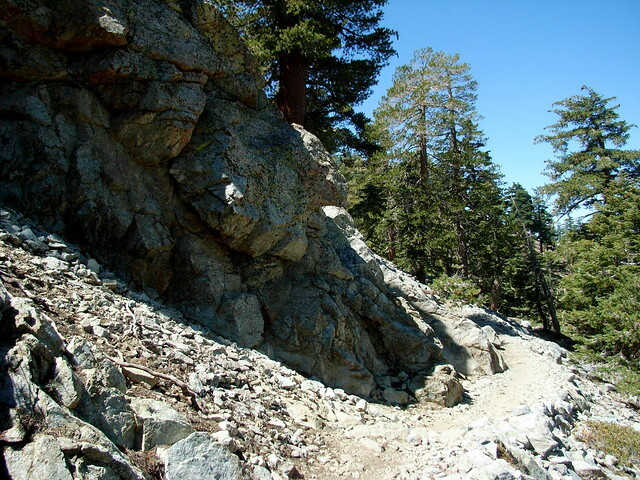 Here, there’s a steep but manageable ascent to the ridge line, where the Ontario Trail intersects with the Bighorn Peak Trail, at about the 4.8 mile mark. After I rested up a bit, I headed east toward Bighorn. The trail starts out easily enough, traversing just north of the ridge, on a slight slope. It has a few steep drop-offs, but nothing terrifying or especially dangerous — just an incline along some talus. 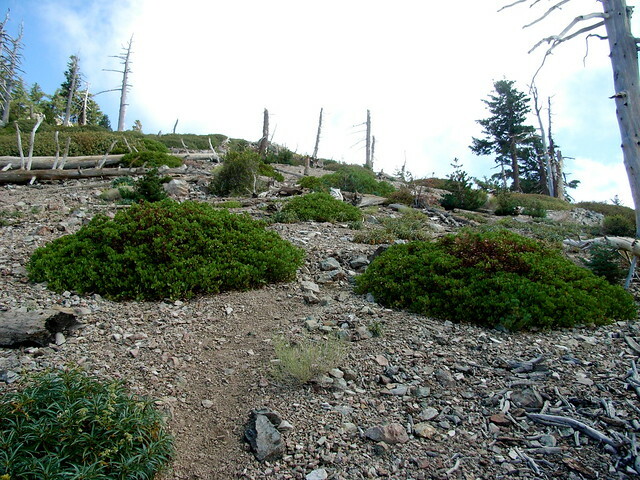 Climb this trail for another 0.2 miles, to reach the summit ridge of Bighorn Peak. 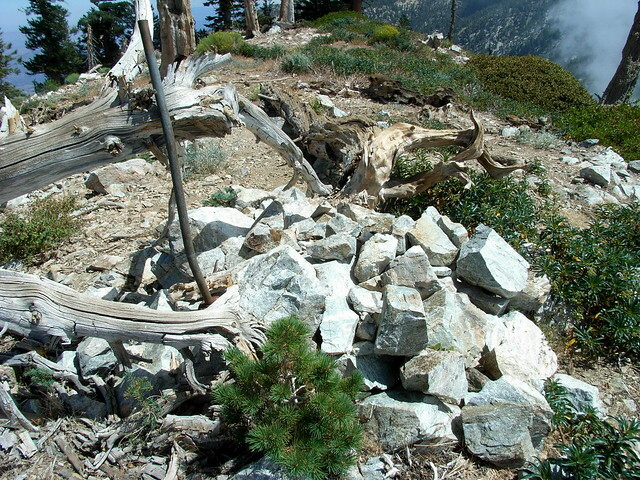 Look for a large pile of boulders on the ridge, which marks the summit. 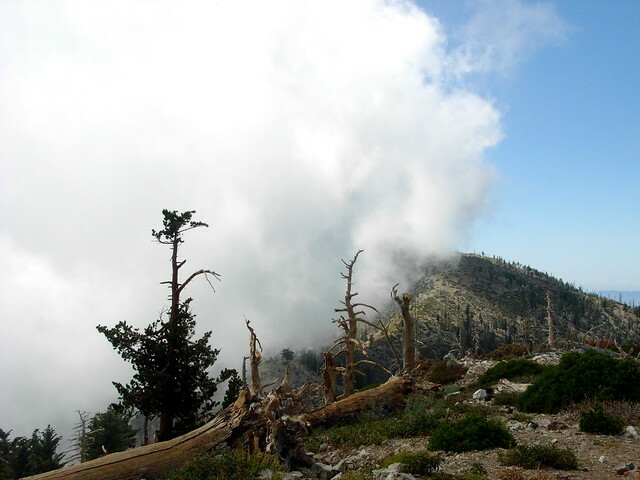 When I did this, I wrote a note in the summit register, and looked up to see the absolutely incredible sight of clouds rolling up onto and over Ontario Peak. I just had to stop and watch for a few moments. After a few moments of quiet reflection, I climbed back down the talus slope and backtracked to the Ontario Peak Trail, now covered even further by clouds. 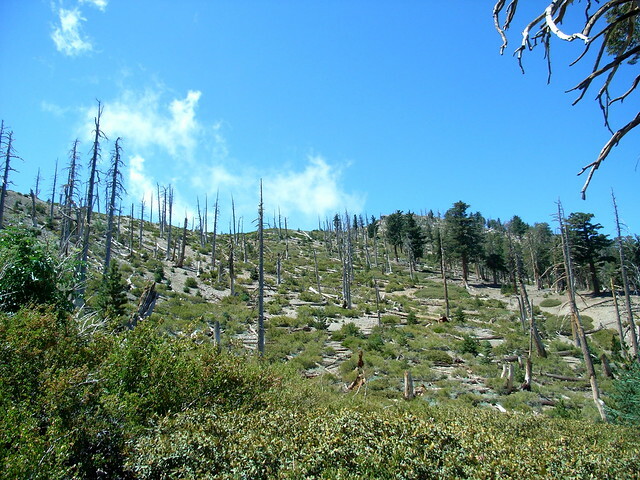 From the junction, the trail sticks well to the north side of the ridge line, moving through taller manzanitas than Bighorn has, and more swaths of dead trees. Still, even with all the dead trees around, it is an area of great beauty and solace. 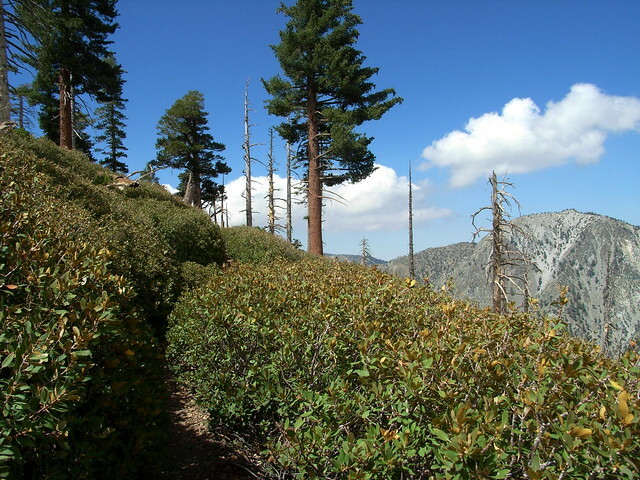 Chances are you’ll be alone up here, with a commanding view of the Baldy Bowl and Cucamonga Wilderness all to yourself. It’s moments like this that are definitely the reason I got into hiking in the first place. Sign it, rest up, and head on back the way you came. Very good. Aside from a small section of trail on Bighorn Peak, all of this track is well marked and very easy to follow. 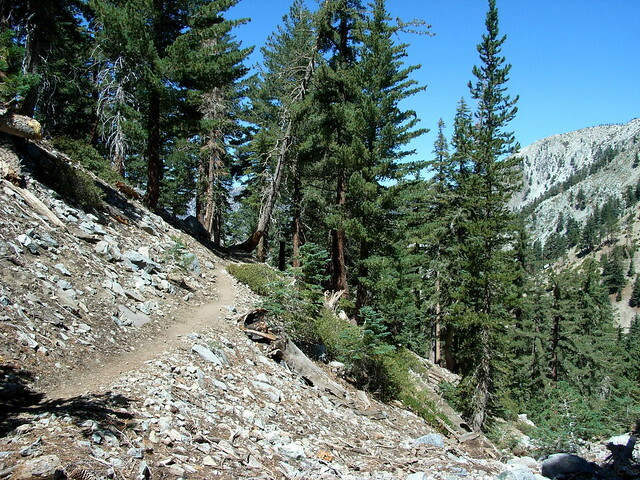 Almost all of the Ontario and Bighorn Peak trails are on the mountain's north face, and have a tendency to ice up faster and longer than the Icehouse Canyon trail in the winter. Use proper gear if you're headed up here in the snow. Backcountry walk-in Kelly Camp sits directly on this route near a mostly-reliable spring. 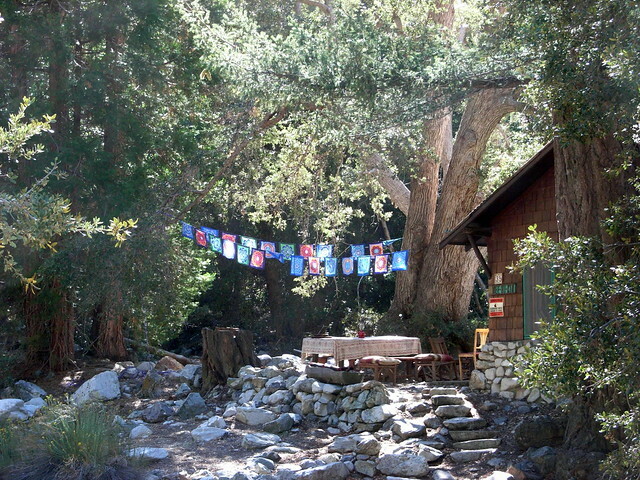 Cedar Glen campground is north of Icehouse Canyon, and the closest developed campsite is at Manker Flats. 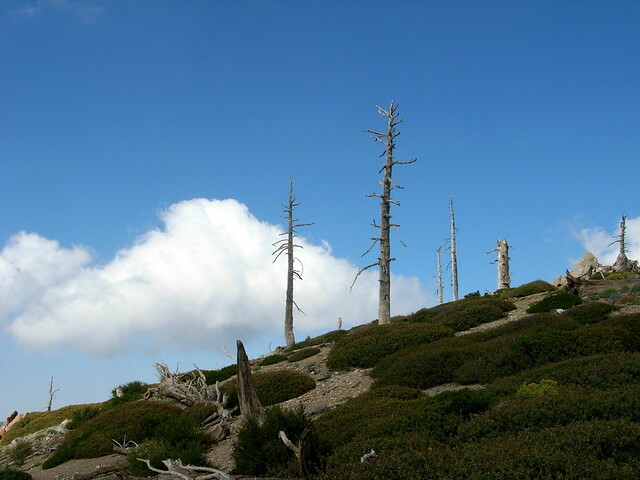 No campfires are allowed in the wilderness camps and free permits are required. Call the Forest HQ at (626) 574-1613 for more info. From the 210 Freeway, exit on Padua Ave. Head north for 1.9 miles, and turn right onto Mount Baldy Road. 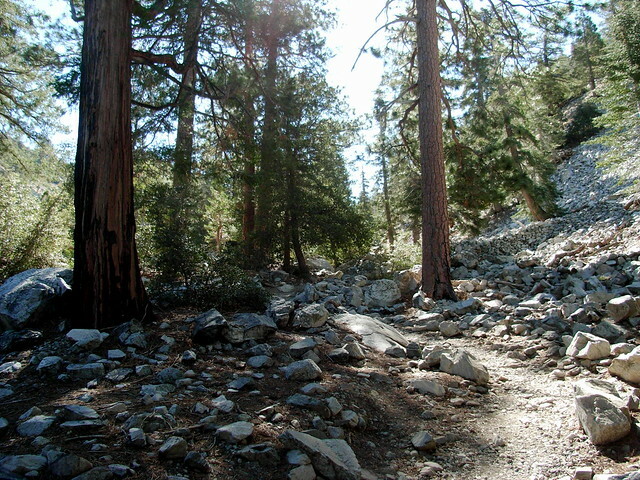 Continue on Mount Baldy Road for 9 miles before veering right at Icehouse Canyon Road. This road dead-ends in a parking lot that is often crowded. Park here and display your Adventure Pass. Not sure when this was originally posted but I am hoping you have since hiked the Chapman trail, it’s the real beauty in hiking icehouse. Far more gorgeous than taking the canyon up to the saddle and worth the two extra miles no matter where you are headed. It’s probably my favorite trail in the range. Hi Casey, Thanks so much for the great write up. My son and I climbed Ontario and Bighorn Peak on 6/18/16 and took your write up and pictures with us as a guide. It was a splendid hike! Thanks again for taking the time to do this. I really wanted to catch a glimpse of the sheep, but I didn't see any sign of them. No sign of any large fauna. No bear, deer or sheep. Somebody in the Kelly Camp suggested that since there isn't water there right now, there was less reason for them to come into the area. Thanks for sharing your experience, Jason! I imagine water would be pretty scarce up there right now so good on you for packing extra in. Did you see any bighorn sheep?! Thank you for posting the details for this hike. It was the reason I embarked on this trail over the 2015 Labor Day Weekend. I hiked up to Kelly Camp, set up my tent and then hiked to Ontario Peak. Columbine Spring had water trickling, so I filled up and filtered it (though many people don't bother) with my Sawyer Mini. At Kelly Camp the pipe that sometimes has water was dry. So, be sure to take enough water up there if you plan to stay the night. One fellow camper packed up 11L. I think 3-6L is enough for one person depending on what you are doing and your own personal needs. I took up 3.5L and had plenty for my freeze dried dinner and coffee the next morning along with enough drinking water for the hikes. One other note, I did get some cell phone coverage on the trails to Ontario and Big Horn. My Verizon service actually picked up full LTE coverage just over the peak and down a bit. I wrote about my trip, gear I brought and coordinates for the cell phone spot at my blog http://www.leadershipdad.com/backpackcountry-in-los-angeles-ontariobig-horn-peaks-kelly-camp/. Good luck everyone on your outdoor adventures and I hope you get a chance to take this trail in the near future. That's awesome, Matt! I, too, have seen some bighorn sheep up there and it's ALWAYS incredible. So glad you were able to experience some of the true magic of the San Gabriels. I hiked up to Ontario Peak this past weekend (08/16/2015) and a herd of Bighorn Sheep literally crossed my path on my way down. I was able to snap a few pictures before they leapt up the hillside. Aside from the views, it’s also a great way to escape the 107 degree weather! It was low to mid 70s the whole time up there. Anyone know what the earliest you can head up on this hike? Planning to do it this weekend. Mt. 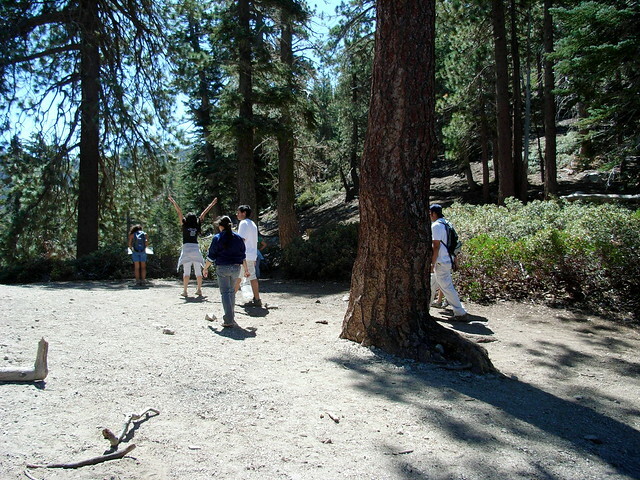 Baldy Visitor Center (ranger station) is open at 7 a.m. weekends. Use the restroom there, the vault toilets in the trailhead parking lot are rank. Make sure you're parked by 8 a.m., earlier on Saturdays, or you will have to hike an extra 1/2 to 1 mile from your car to the trailhead. Or you may not find parking at all. TIP: Bring up a celebratory beer with you when summiting Ontario... there's a bottle opener bolted to the trunk of the old tree.